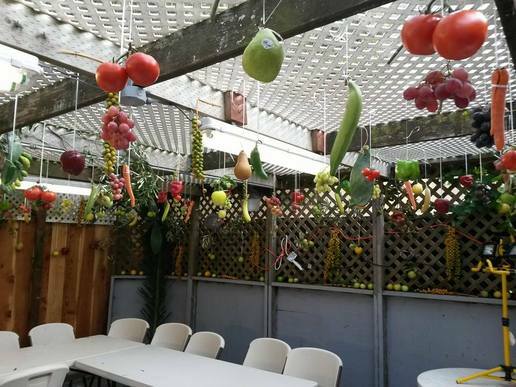 What is Sukkot: The formal name for the holiday of Sukkot is Hag HaSukkot, or the Feast of Booths. In English, the holiday is also referred to as the Feast of Tabernacles. A sukkah (the singular form of “sukkot”) is a booth, and during the holiday we are commanded to dwell in booths (Leviticus 23:42) to remember that when the Israelites left Egypt, we wandered in the desert for forty years and dwelled in temporary structures. The Karaite Take on Sukkot: The majority of the Karaite Sages, in accordance with the practice recorded in the book of Nehemiah, determined that we are to build our sukkot out of the materials listed in Leviticus. Some Karaite Sages, such as Hakham Yefet ben ‘Ali, believe that the “splendid fruit tree” is the “olive tree,” based on the practice described in Nehemiah 8:15, in which the Israelites gathered olive branches, among other items, in order to build their sukkot. A minority of Karaite Sages believe that the items mentioned in Leviticus were intended to fulfill the requirement to “rejoice before Hashem your God,” which appears immediately after Leviticus’ list of greenery. (Leviticus 23:40.) According to these Sages, the Israelites would make bundles of greenery and fruits of all kind to eat throughout the festival. Want More Information: You can read more about Karaite views of Sukkot in our Virtual Reading Room or here. Songs: Karaites have composed some wonderful songs for Sukkot. One of the songs is “Hogi Yehudah”, and the words in Hebrew are in the linked document. It is customary for a different member of the congregation to sing each verse, with the entire congregation joining for the chorus – which appears in bold.